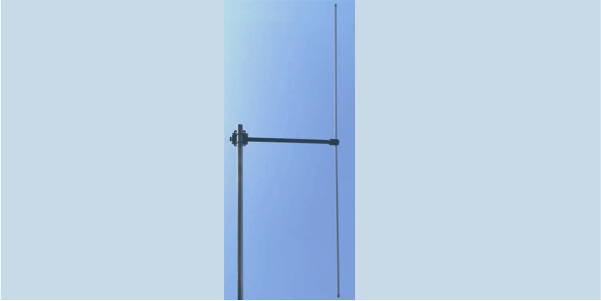 AD-39/3512 is a visually unobtrusive omnidirectional dipole wideband antenna for fixed-site operation from 30 MHz to 512 MHz with power handling of 100 W.
AD-39/3512 is a dipole antenna for stationary antenna use at VHF and UHF frequencies from 30 - 512 MHz. It is composed of a matching unit and balun transformer arm with screw-in dipole elements. Dipoles are made from brass tubing enclosed in fiberglass housing which also contains a special passive element for better gain characteristics. The antenna pattern is essentially omni-directional, with full instantaneous bandwidth, making it ideal for wideband communication applications. AD-39/3512 is constructed entirely from corrosion-resistant materials and the -T version comes with a handy carry bag for field transportable applications.